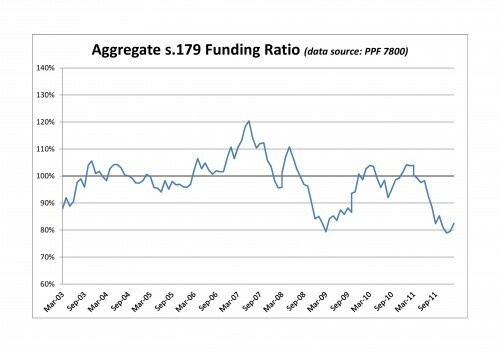 The Pension Protection Fund produces a monthly index update (the March 2012 release has data taken as at 29 February 2012) of the estimated funding position of the defined benefit schemes which would be potentially eligible for entry into the Fund. 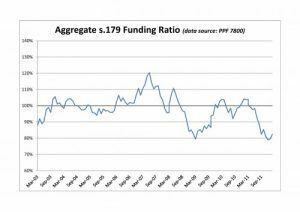 Total scheme deficits showed an decrease from £265.5bn as at end January to £222.2bn as at end February with a corresponding improvement in s179 funding ratio to 82.4%. The backdrop to this change over the month was an improvement both in equity markets (helping assets) and gilt yields (helping liabilities) between the end of January and February.